Desert (Re)Collection is a demonstration piece for a device/idea. As an approach to interactive storytelling, and playing with references to music composition, a narrative synthesizer was created. Much as a sound synthesizer plays sounds associated with piano keys, a narrative synthesizer displays stories associated with piano keys. Holding a single key displays that key's story, while playing chords (ie. holding multiple keys simultaneously) displays a conflation of the various stories. The stories used in this piece are anecdotes from my memories. The chosen anecdotes all relate to deserts, mountains, or rivers, as the landscape of the piece is a desert with a river coursing down from a mountain. Specifically, the stories are memories of growing up in South Korea, boyhood adventures in Egypt, and times shared with my girlfriend in Arizona and southwestern Pennsylvania. By giving over the stories for participants to play with, they are more fully engaged with the imparted knowledge. 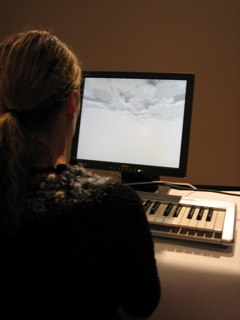 Participants with the piece sit down at a table that has a computer monitor and a MIDI piano keyboard. Displayed on the screen is a desert landscape, but initially visuals are difficult to interpret due to the loosely sketched render style. As the participant presses down on keys, text appears on screen and the viewpoint shifts to a new location in the landscape. 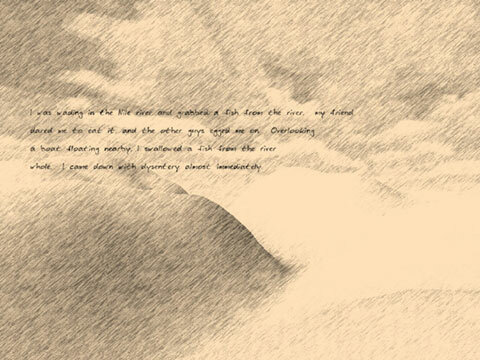 Everything is depicted as hand-drawn visuals, suggesting a storybook aesthetic. The combining of stories is based on extracted narrative elements, with elements from various stories having various weights. For example, when multiple keys are hit, the antagonist of greatest weight is used with the plot of greatest weight. In this way the displayed text is a newly generated story, created from a combination of existing stories. 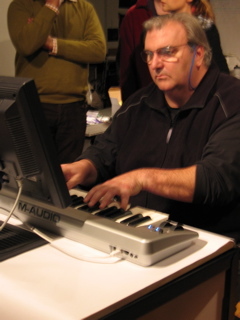 The piece was programmed in Blitz3D and ran on a Dell PC with an M-Audio Keystation 49e for input. Future experimentation is planned for both the mechanisms of narrative combining and the visuals of the piece. In particular, the locations moved to while interacting should tie in with the displayed story, perhaps through location-specific objects in the scenery.